Cedrus brevifolia is endemic to a very small area in the Troodos Mountains of western Cyprus; its very small population is prone to fire. The IUCN Redlist treats this taxon as a variety of Cedrus libani. Tree 15–20m, d.b.h. 1–1.2m, older trees flat-topped. Bark pale greyish-brown, fissured; branches spreading and forming distinctive horizontal layers. Leaves on long shoots spirally arranged, radially spreading; short shoots emerging in leaf axils, leaves densely crowed in false whorls 20-35, often distinctly incurved, apices shortly acute to bluntish, 15–20 x 1.5–2mm, light or dark green but more often glaucous. Male pollen-cones terminal, borne on short shoots, erect, 4–5cm long, cylindrical, curved pale broiwn when mature. Female seed-cones 8 x 5cm, terminal, borne on short shoots, erect, sessile, taking two years to mature when they become woody, ovoid oblong or barrel-shaped, ripening grey-brown. Seeds 10–14 x 4–6mm, winged, brown. 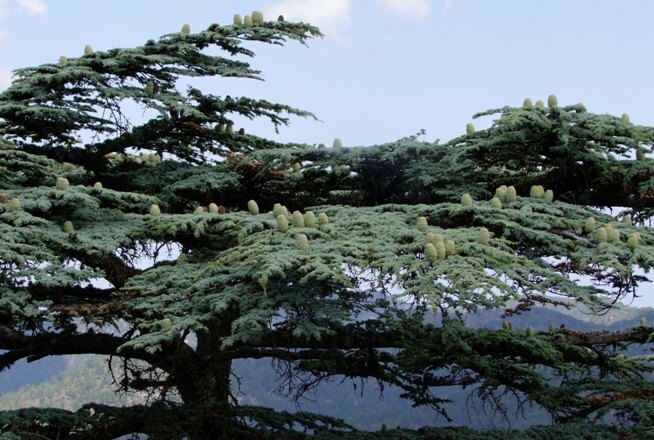 Closely related to Cedrus libani with which it is sometime included as a subspecies or variety. It differs in having shorter leaves (mostly less tha 15mm x 1.5–2mm), and are often distictly incurved with shortly acute apices. Cones are usually less than 8 x 5cm. 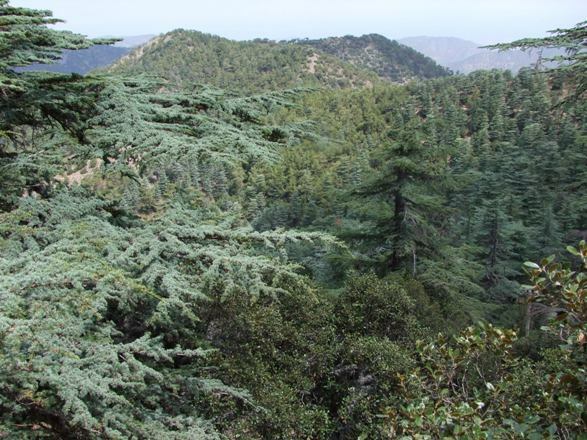 Restricted to the Tripylos area in Paphos State Forest in the Troodos Mountains in western Cyprus. The population occurs in five natural stands (Tripylos, Mauroi Kremoi, Sellae tis Ellias, Throni and Exo Milos). 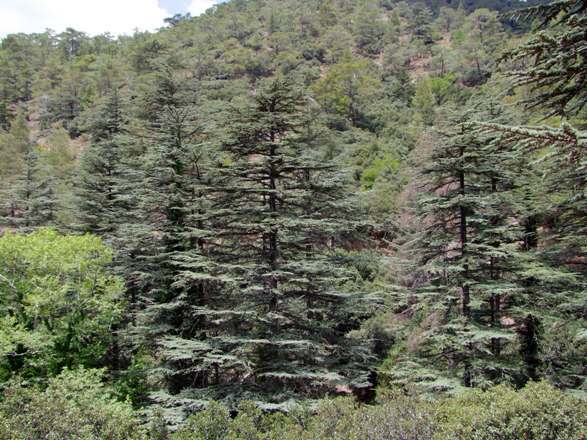 The majority of the trees occur in the location of Tripylos which has an area of occupancy of 1.99km² and comprises16,000 mature individuals with diameter at breast height (d.b.h.) of 12cm and 135,000 individuals with d.b.h.of 12cm. Limited genetic research suggests that there is significant genetic differentiation among the neighbouring stands (Eliades, 2008). Sometimes in pure forests, especially on the mountain tops but often associated with Pinus brutia and Quercus alnifolia and mixed forest with Platanus orientalis. The substrate is of igneous formations. Good seed crops are typically produced once every five to seven years with a 50–60% seed viability. The wood of this cedar used to be used for the construction of wooden artefacts In old churches. Because of its resistance to decay and infestation by insects and fungi, local people used to put pieces of cedar wood inside their clothes lockers as protection. The area of occupancy is considerably less than 20km² and it is known from one location. The population appears to be increasing although some trees are showing signs of dieback that have been correlated with decreasing rainfall (Christou et al., 2001). Its very restricted distribution makes it vulnerable to stochastic events despite the numerous protection measures that have been put in place. Although this species meets some of the criteria for Critically Endangered there is insufficient evidence of significant on–going decline in extent of occurrence, the number of mature individuals or extreme fluctuations. A continuing decrease in rainfall and an increase in the number of trees showing symptoms of dieback could mean that it could be upgraded to Critically Endangered in the near future. It is currently listed as Vulnerable. The main threats are fire and possibly climate changes. Because of the narrow distribution of this species, a single fire has the potential of destroying most, if not the entire population. More recently, research has shown a direct correlation between decreasing annual rainfall and canopy die-back. Debilitated trees have also become prone to insect attack (Christou et al., 2001). All stands have recently been declared as Natura 2000 Sites while some were designated as National Nature Reserves in 1984 and 2000. All human activities and grazing are excluded from the native stands and there is an effective fire protection system in place and a permanent monitoring plan. Gene banks have also been established in the form of ex–situ conservation plantations. 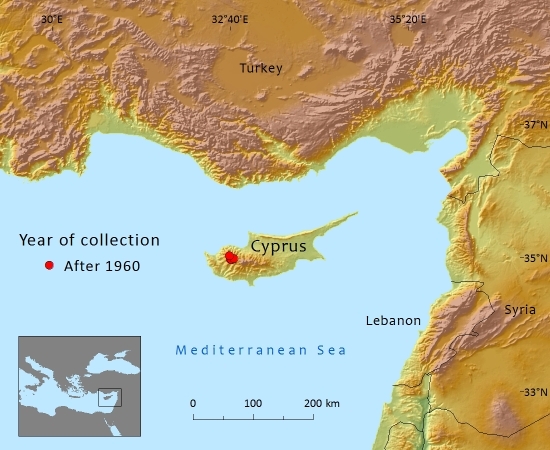 In 2010 a new project was started entitled 'Establishment of a Plant Micro-Reserve Network in Cyprus for the Conservation of Priority Species and Habitats' (PLANT-NET CY) funded by the European Commission from within the LIFE+ 08 programme. Its main objective is to improve the conservation status of priority plant species and habitat types in Cyprus that are found in NATURA 2000 sites which includes Cedrus brevifolia. The project runs until June 2013. Christou, K.A., Hatzikyriakou, X. and Nikolaou, C. (2001). Die-back of Cyprus cedar (Cedrus brevifolia) at Pafos forest. Conference: Forest Research: A challenge for an integrated European approach Greece, August 27–1 September 1p. Eliades Nicolas-George, H. (2008). 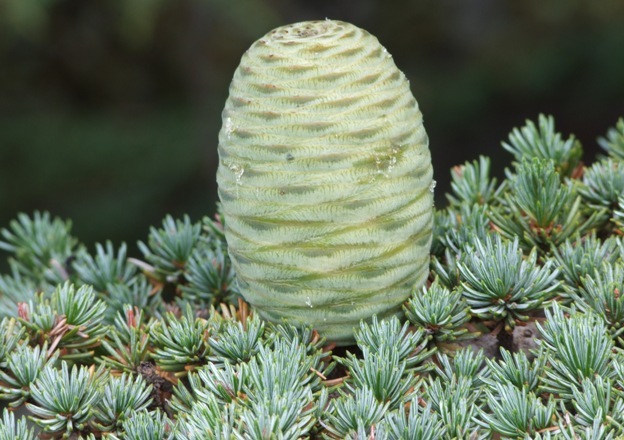 Fingerprinting of genetic diversity and patterns of spatial genetic variation in the endemic tree Cedrus brevifolia (Hook.f.) Henry from Cyprus: implications for its conservation. Optimus Mostafa Verlag. Tsintides, T., Christodoulou, C.S., Delipetrou, P. & Georghiou, K. (2007). The Red Data Book of the Flora of Cyprus. Cyprus Forestry Association, Lefkosia. A.Christou,and M.F.Gardner, 2015. Cedrus brevifolia, from the website, Threatened Conifers of The World (http://threatenedconifers.rbge.org.uk/taxa/details/82).